Carbon dioxide is a chemical compound composed of one carbon and two oxygen atoms. It is often referred to by its formula CO2. It is present in the Earth's atmosphere at a low concentration and acts as a greenhouse gas. In its solid state, it is called dry ice. It is a major component of the carbon cycle. Atmospheric carbon dioxide derives from multiple natural sources including volcanic outgassing, the combustion of organic matter, and the respiration processes of living aerobic organisms; man-made sources of carbon dioxide come mainly from the burning of various fossil fuels for power generation and transport use. It is also produced by various microorganisms from fermentation and cellular respiration. Plants utilize carbon dioxide during photosynthesis, using both the carbon and the oxygen to construct carbohydrates. In addition, plants also release oxygen to the atmosphere, which is subsequently used for respiration by heterotrophic organisms, forming a cycle. Carbon dioxide is used to produce carbonated soft drinks and soda water. Traditionally, the carbonation in beer and sparkling wine comes about through natural fermentation, but some manufacturers carbonate these drinks artificially. A candy called Pop Rocks is pressurized with carbon dioxide gas at about 600 PSI. When placed in the mouth, it dissolves (just like other hard candy) and releases the gas bubbles with an audible "pop." The leavening agents used in baking produce carbon dioxide to cause dough to rise. Baker's yeast produces carbon dioxide by fermentation within the dough, while chemical leaveners such as baking powder and baking soda release carbon dioxide when heated or exposed to acids. Carbon dioxide extinguishes flames, and some fire extinguishers, especially those designed for electrical fires, contain liquid carbon dioxide under pressure. Carbon dioxide also finds use as an atmosphere for welding, although in the welding arc, it reacts to oxidize most metals. Use in the automotive industry is common despite significant evidence that welds made in carbon dioxide are brittler than those made in more inert atmospheres, and that such weld joints deteriorate over time because of the formation of carbonic acid. It is used as a welding gas primarily because it is much less expensive than more inert gases such as argon or helium. Liquid carbon dioxide is a good solvent for many organic compounds, and is used to remove caffeine from coffee. First, the green coffee beans are soaked in water. The beans are placed in the top of a column seventy feet (21 metres) high. The carbon dioxide fluid at about 93 degrees Celsius enters at the bottom of the column. The caffeine diffuses out of the beans and into the carbon dioxide. Plants require carbon dioxide to conduct photosynthesis, and greenhouses may enrich their atmospheres with additional CO2 to boost plant growth. It has been proposed that carbon dioxide from power generation be bubbled into ponds to grow algae that could then be converted into biodiesel fuel. High levels of carbon dioxide in the atmosphere effectively exterminate many pests. Greenhouses will raise the level of CO2 to 10,000 ppm (1%) for several hours to eliminate pests such as whiteflies, spider mites, and others. In medicine, up to 5% carbon dioxide is added to pure oxygen for stimulation of breathing after apnea and to stabilize the O2/CO2 balance in blood. Liquid carbon dioxide was used as a refrigerant prior to the discovery of R-12 and may be enjoying something of a renaissance due to environmental concerns. Its physical properties are not favorable, having a low critical temperature of 88F/31C (the maximum temperature at which it will condense from gas to liquid) and high critical pressure of 1070 psi (the pressure required for phase change at the critical temperature). These properties necessitate the use of very strong refrigeration plumbing to contain the operating pressure of ~1400 psi, in contrast to pressures of ~300 psi for R-134a systems. Although carbon dioxide is non-inflammable and non-toxic it is an asphyxiant, which raises safety concerns in the case of leaks in enclosed spaces or system rupture in the case of vehicle accident. Despite these issues Coca-Cola has fielded CO2-based beverage coolers and the US Army and others have expressed interest. As of 2006, the earth's atmosphere is about 0.038% by volume (381 µL/L or ppmv) or 0.057% by weight CO2. This represents about 2.97 × 1012 tonnes of CO2. Because of the greater land area, and therefore greater plant life, in the northern hemisphere as compared to the southern hemisphere, there is an annual fluctuation of about 5 µL/L, peaking in May and reaching a minimum in October at the end of the northern hemisphere growing season, when the quantity of biomass on the planet is greatest. The latest data, as of March 2006, shows CO2 levels now stand at 381 parts per million (ppm) - 100ppm above the pre-industrial average. Despite its small concentration, CO2 is a very important component of Earth's atmosphere, because it absorbs infrared radiation and enhances the greenhouse effect. The initial carbon dioxide in the atmosphere of the young Earth was produced by volcanic activity; this was essential for a warm and stable climate conducive to life. Volcanic activity now releases about 130 to 230 teragrams (145 million to 255 million short tons) of carbon dioxide each year. Volcanic releases are about 1% of the amount which is released by human activities. Since the start of the Industrial Revolution, the atmospheric CO2 concentration has increased by approximately 110 µL/L or about 40%, most of it released since 1945. Monthly measurements taken at Mauna Loa since 1958 show an increase from 316 µL/L in that year to 376 µL/L in 2003, an overall increase of 60 µL/L during the 44-year history of the measurements. 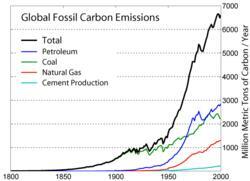 Burning fossil fuels such as coal and petroleum is the leading cause of increased man-made CO2; deforestation is the second major cause. Around 24,000 million tonnes of CO2 are released per year worldwide, equivalent to about 6500 million tonnes of carbon. In 1997, Indonesian peat fires may have released 13%-40% as much carbon as fossil fuel burning does. Various techniques have been proposed for removing excess carbon dioxide from the atmosphere in carbon dioxide sinks. Not all the emitted CO2 remains in the atmosphere; some is absorbed in the oceans or biosphere. The ratio of the emitted CO2 to the increase in atmospheric CO2 is known as the airborne fraction (Keeling et al., 1995); this varies for short-term averages but is typically 57% over longer (5 year) periods. The Global Warming Theory (GWT) predicts that increased amounts of CO2 in the atmosphere tend to enhance the greenhouse effect and thus contribute to global warming. 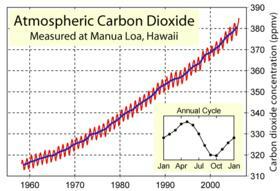 The effect of combustion-produced carbon dioxide on climate is called the Callendar effect. The most direct method for measuring atmospheric carbon dioxide concentrations for periods before direct sampling is to measure bubbles of air (fluid or gas inclusions) trapped in the Antarctic or Greenland ice caps. The most widely accepted of such studies come from a variety of Antarctic cores and indicate that atmospheric CO2 levels were about 260-280µL/L immediately before industrial emissions began and did not vary much from this level during the preceding 10,000 years. The longest ice core record comes from East Antarctica, where ice has been sampled to an age of 800,000 years before the present. During this time, the atmospheric carbon dioxide concentration has varied between 180-210 µL/L during ice ages, increasing to 280-300 µL/L during warmer interglacials. The data can be accessed at http://www.ncdc.noaa.gov/paleo/icecore/antarctica/vostok/vostok_data.html. 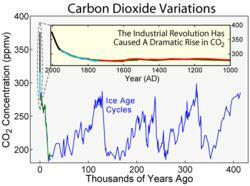 Some studies have disputed the claim of stable CO2 levels during the present interglacial (the last 10 kyr). Based on an analysis of fossil leaves, Wagner et al. argued that CO2 levels during the period 7-10 kyr ago were significantly higher (~300 µL/L) and contained substantial variations that may be correlated to climate variations. Others have disputed such claims, suggesting they are more likely to reflect calibration problems than actual changes in CO2. Relevant to this dispute is the observation that Greenland ice cores often report higher and more variable CO2 values than similar measurements in Antarctica. However, the groups responsible for such measurements believe the variations in Greenland cores result from in situ decomposition of calcium carbonate dust found in the ice. When dust levels in Greenland cores are low, as they nearly always are in Antarctic cores, the researchers report good agreement between Antarctic and Greenland CO2 measurements. 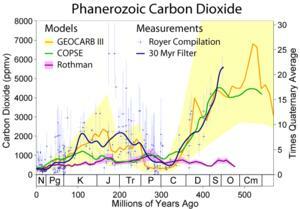 Changes in carbon dioxide during the Phanerozoic (the last 542 million years). The recent period is located on the left-hand side of the plot, and it appears that much of the last 550 million years has experienced carbon dioxide concentrations significantly higher than the present day. On longer timescales, various proxy measurements have been used to attempt to determine atmospheric carbon dioxide levels millions of years in the past. These include boron and carbon isotope ratios in certain types of marine sediments, and the number of stomata observed on fossil plant leaves. While these measurements give much less precise estimates of carbon dioxide concentration than ice cores, there is evidence forveryhighCO2concentrations(>3,000 µL/L) between 600 and 400 Myr BP and between 200 and 150 Myr BP. On long timescales, atmospheric CO2 content is determined by the balance among geochemical processes including organic carbon burial in sediments, silicate rock weathering, and vulcanism. The net effect of slight imbalances in the carbon cycle over tens to hundreds of millions of years has been to reduce atmospheric CO2. The rates of these processes are extremely slow; hence they are of limited relevance to the atmospheric CO2 response to emissions over the next hundred years. In more recent times, atmospheric CO2 concentration continued to fall after about 60 Myr BP, and there is geochemical evidence that concentrations were <300 µL/L by about 20 Myr BP. Low CO2 concentrations may have been the stimulus that favored the evolution of C4 plants, which increased greatly in abundance between 7 and 5 Myr BP. Although contemporary CO2 concentrations were exceeded during earlier geological epochs, present carbon dioxide levels are likely higher now than at any time during the past 20 million years and at the same time lower than at any time in history if we look at time scales longer than 50 million years. NOAA research estimates that 97% of atmospheric CO2 created each year is from natural sources and approximately 3% is from human activities. Reactions like this tend to buffer changes in atmospheric CO2. Reactions between carbon dioxide and non-carbonate rocks also add bicarbonate to the seas, which can later undergo the reverse of the above reaction to form carbonate rocks, releasing half of the bicarbonate as CO2. Over hundreds of millions of years this has produced huge quantities of carbonate rocks. If all the carbonate rocks in the earth's crust were to be converted back into carbon dioxide, the resulting carbon dioxide would weigh 40 times as much as the rest of the atmosphere. The vast majority of CO2 added to the atmosphere will eventually be absorbed by the oceans and become bicarbonate ion, but the process takes on the order of a hundred years because most seawater rarely comes near the surface. Carbon dioxide was one of the first gases to be described as a substance distinct from air. In the sevententh century, the Flemish chemist Jan Baptist van Helmont observed that when he burned charcoal in a closed vessel, the mass of the resulting ash was much less than that of the original charcoal. His interpretation was that the rest of the charcoal had been transmuted into an invisible substance he termed a "gas" or "wild spirit" (spiritus sylvestre). Carbon dioxide's properties were studied more thoroughly in the 1750s by the Scottish physician Joseph Black. He found that limestone (calcium carbonate) could be heated or treated with acids to yield a gas he termed "fixed air." He observed that the fixed air was denser than air and did not support either flame or animal life. He also found that it would, when bubbled through an aqueous solution of lime (calcium hydroxide), precipitate calcium carbonate, and used this phenomenon to illustrate that carbon dioxide is produced by animal respiration and microbial fermentation. In 1772, Joseph Priestley used carbon dioxide produced from the action of sulfuric acid on limestone to prepare soda water, the first known instance of an artificially carbonated drink. A website like http://cssa-unn.com will provide you with the highest quality in the industry. If you are looking for GPS Fleet Tracking Device then read the info .